Boone County Communities – REDI | Regional Economic Development Inc.
Ashland, Missouri is located in Southern Boone County and is one of the region’s fastest growing communities along the Highway 63 corridor. As the population continues to grow, residents still enjoy the quaint, small-town ambiance along with the excellent Southern Boone County School District, thriving churches and impressive residential developments. Ashland’s location is a treasure for Boone County. Many residents enjoy the easy commute to Columbia or Jefferson City both less than 15 minutes away on US Highway 63, a four lane divided highway. The regional airport on the northern edge of the city is just minutes from downtown Ashland. It is a prime development site for the mid-Missouri region. Also located within a ten minute drive of city limits is access to the Katy Trail State Park system that stretches across the state and runs along the Missouri River bluffs. 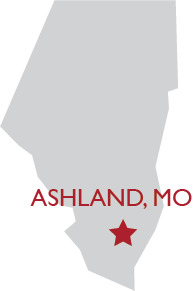 The City of Ashland website, www.ashlandmo.us opens in a new window, has additional details about city government, city services, city staff and Southern Boone Schools. The greater Ashland Area is also represented by two active entrepreneurial groups. The Southern Boone Chamber of Commerce opens in a new window, provides business support to business entities. The Southern Boone Economic Development Council opens in a new window, provides resources and support to new business attraction, site selection, infrastructure and existing business development opportunities. Each of their websites provides additional information on the community, chamber membership and events. Hallsville, Missouri, was the second fastest growing city in Boone County, tripling in size in the last 15 years according to the 2010 Census. Just 10 miles north of I-70, it offers the ambiance of a quaint community with an excellent school district. Hallsville has an Industrial Park, and a 120-acre zoned industrial site that is shovel ready. With many service businesses, eateries, and a bed and breakfast, Hallsville makes a great day trip to visit its unique gift shops. With a new grocery store, salon, and clothing store recently opened, the active Chamber of Commerce keeps the business community revitalized. Hallsville is put on the world map for hosting the NRA/Midway USA Bianchi Cup Shooting Match at the Green Valley Rifle & Pistol Club, and the VORTAC known by pilots around the country. Hallsville has one of the lowest property tax, sales tax, and user fee rates in the area, and the only entity in Boone County with a ‘Back-to-School’ sales tax holiday, which keeps the cost of living down for an affordable quality of life. 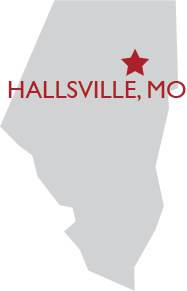 Hallsville’s mottos are: “The Small City With a Big Heart”, and “Hallsville…a great place to live, a great place to learn, and a great place to grow!” Find more information at www.hallsvillemissouri.wordpress.com opens in a new window. Centralia, Missouri, is the second largest community in Boone County and is located approximately 25 miles northeast of Columbia. Centralia was founded in 1857 as a station on a new railroad from St. Louis to Ottumwa, Iowa. Today, Centralia is served by both the Norfolk Southern and Kansas City Southern rail lines and by the Columbia Terminal Railroad. Centralia is the home of Hubbell/Chance, a major manufacturing and distribution facility of equipment for electrical distribution systems. The city is a steadily growing residential community, and also a retail trade center. A high value is placed on education through support of a modern school system and a nationally-recognized public library district. Centralia has established an Enhanced Enterprise Zone (EEZ) that offers aggressive tax benefits for new or expanding industrial employers. 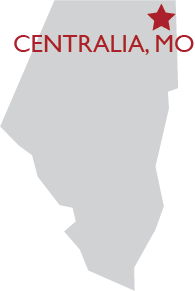 The City of Centralia website, www.centraliamo.org opens in a new window has information about city services and government, with links to other community and regional organizations. Centralia Area Chamber of Commerce’s website, www.centraliamochamber.com opens in a new window, has information on area businesses, Civil War history, area festivals and events. Centralia also has a local business support group, CREDI, found at www.centraliaredi.org opens in a new window.